Most major banks have treated mobile banking as an enigma wrapped in a paradox over the last two years. They have convinced themselves that the growth of mobile banking was an unpredictable occurrence. In insurance terms they would probably claim it was ‘an act of god’. The real truth is that this so called 'overnight sensation' was at least a decade in the making. Since South African bank Absa launched the first mobile banking solution in 2002, leading experts, analysts and futurists have predicted the mass adoption of mobile banking services. The banks were blind – nothing else. Initially this lack of foresight related to the arrival of mobile. Now it relates to the disruption it is causing to their traditional business model. Initially banks thought that they had more time to play with. ‘I have heard this all before’, exclaimed most Senior Bank Executives when they were first presented with the threats and opportunities around mobile. Over the past 50 years, four major banking innovations have been launched to market - Cards, ATM’s, Telephone and Online banking. All were touted as the next big thing. All were expected to change banking forever. Whilst they all did to some extent, the approach, processes, people and most importantly, profit areas remained the same. 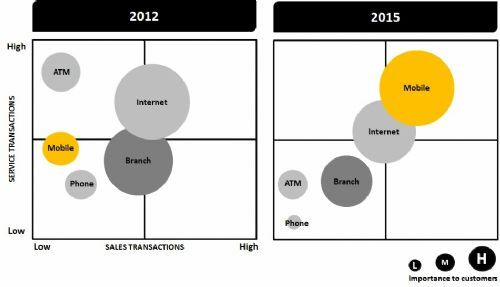 The predicted reduction in branches linked to the adoption of Telephone and Online banking never materialised. Instead of embracing the mobile opportunity, banks had become complacent about change. Unfortunately this time it was different. Consumers became addicted to getting access to information anytime and anywhere. It made them feel in control. It empowered them to make more informed decisions – better decisions. The mass adoption of smartphones, and their greater capabilities, has meant that mobile has become our sixth sense. In the same way that we use our senses such as sight, smell and hearing to guide what we do, we rely on a mobile in much the same way. It augments the information that we have to hand. Instead of being restricted to what we know, we can draw on the collective insight of billions of people through the tap of a finger. With a mobile in our pocket we can do anything. Due to this consumer behaviour shift we are seeing a huge increase in mobile banking activity. It makes perfect sense. Pre-mobile we had to rely on our memory or paper to function. We would print off a map to get to an unknown destination or keep a sticky note with an important contact number. When visiting a branch or ATM we would keep a mental record of our balance. We would then keep a running total in our head after every transaction. Even after Online Banking was launched we still had to remember our balance before we left the house. Mobile has removed this process we trained into ourselves. Memory has been replaced by logins. We just access our banking app whenever we need to know our latest financial position. With online banking transactions already plateauing (and at some banks in decline) mobile volumes continue to surge. Most banks are already seeing in excess of 30% of their transactions done on a mobile. Sound like a tipping point? Interestingly the majority of these transactions are also incremental. They are new transactions that people were not doing in the past. People found friction in banking – going to a branch or finding an ATM - and now they can bypass that. With the majority of transactions being new, mobile is not eating into the pie, it is growing it. The great white hope that mobile would lead to migration away from higher cost channels, namely branch, just hasn’t eventuated yet. To give you are sense of the volume of incremental mobile usage, most banks are seeing customers log in excess of 20 times a month. This is 4 times the average for most Online banking sites. This means that once mobile banking reaches saturation point in the overall customer base, the bank is going to see a significantly higher amount of data than ever before. Think about this way. The number of interactions consumers are having with their bank has increased from once a week, for much of the last century, to nearly once a day. This volume of activity creates so many opportunities and is the one key advantage banks have over new disruptive entrants - a large and already engaged customer base. This increase in transactions is going to lead to a fundamental shift in the banks business model and a lot of banks are ill prepared for it. Mobile will move from 30 per cent of transactions to the highest transaction channel for the bank. Existing channels will be compared to mobile - not the other way around. Mobile will also move from a predominately service based channel to also the lead product up-sell and cross-sell engine for banks. As you can see from the diagram below, the relevant size of the bubble indicates the channels relative importance to customers. The positioning on the X and Y-Axis indicates the volumes of service and sales transactions. As you can see by 2015 this will change drastically. Because of the shift in transaction volumes and importance, look for sales and marketing to become a prominent feature of mobile soon. If you look at most mobile banking services today they have little to no direct sales capability. Banks are increasingly driving traffic from their most capable sales channel to their lowest. As more and more transactions are moved, this hole in revenue will become glaringly obvious. This will also cause an impact because there will be an increasing segment of customers who are exclusive mobile users. That is, they won’t interact with the bank any other way. What makes this ‘great migration’ difficult for banks, is that most of them have just completed expensive upgrades of their sales capability for their online banking site. For the true mobile opportunity to take hold, true transformation must occur. There needs to be a ‘once I was blind, but now I can see’ moment. There must be an unwavering commitment to mobile from banks. No more waiting and talking – just action. Banks must also evolve their cultural attitudes. Mobile is a device that demands engagement. Instead of relying on a customer to initiate every activity, the bank must play a proactive role. They must inform customers of what they should be doing with their money. Not just provide the tools for them to do it. Mobile is the perfect communications tool for delivering this shift. Banking today is like going into a restaurant and being directed to the kitchen to cook your own meal. Customers want the fantastic meal not the utensils.